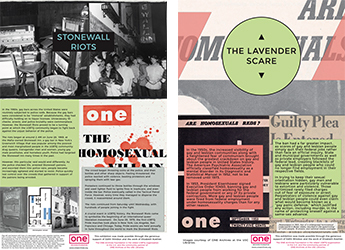 The ONE Archives Foundation, Inc. is the leading provider of high quality and visually engaging History Panels that educate and enthuse various audiences about LGBTQ history and culture. The vividly illustrated Panels feature hundreds of rare images, many never before seen documents, and informative text that deepen the general public’s knowledge of LGBTQ history. 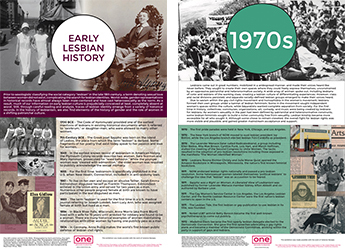 We invite you to explore the themes of our History Panel series below. This exhibition explores the incredibly inspiring journey of the LGBTQ Civil Rights movement from World War II to present day by highlighting important LGBTQ organizations, activists, groups, and events that have defined this movement. 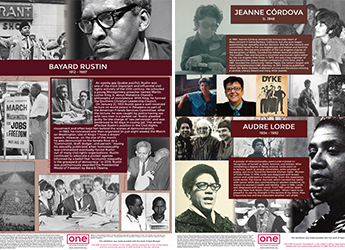 This exhibition highlights the remarkable LGBTQ pioneers that have made significant contributions to the movement’s history and were front and center at the birth of the LGBTQ civil rights movement. This exhibition covers lesbian history from 1700 BCE to present day, highlighting the remarkable events and individuals that have made significant contributions to the movement’s history. 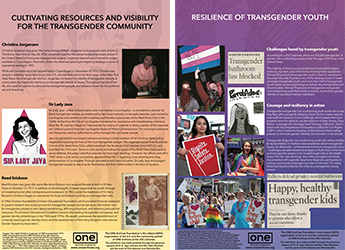 This exhibition presents a concise overview of the courageous individuals and critical events that encompass aspects of transgender history in the United States. 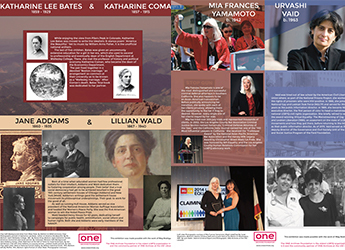 This exhibition highlights notable lesbians from around the world who accomplished over a hundred years’ worth of firsts in the fields of science, politics, arts, and much more. 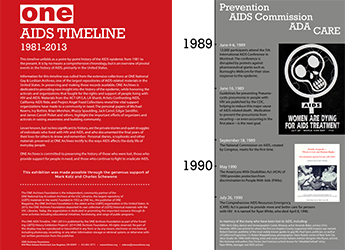 This exhibit provides an insight into the history of the AIDS crisis starting in 1981. Interested parties may purchase entire History Panel series, or mix and match select Panels from different series. History Panels can be downloaded as high resolution PDFs for digital use or for local printing, or they can be shipped as fully printed, lightweight foam core panels ranging from 18″ x 24″ to 24″ x 36″. Depending on the unique needs of the space, History Panels can be displayed on easels, secured to a wall, or hung. To request pricing estimates, display options, or for general inquiries, please email askone@onearchives.org.